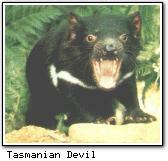 If you thought that the Tasmanian Devil existed only in Bugs Bunny cartoons, think again. 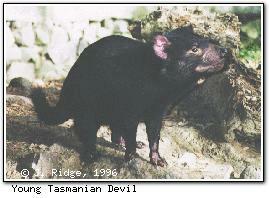 The Tasmanian Devil is a common marsupial found only in Tasmania. It is nocturnal and was named by early European settlers because of its eerie growl, which starts as a kind of whistle and ends in a bark. Devils have a body length of approximately 2 feet (60cm), and are known for their ferocity and foul tempers. They generally eat other small mammals and reptiles, as well as scavenging on dead animals of all kinds. Tasmanian Devils, 4.09Mb QuickTime movie. Tasmanian Devils have some of the strongest jaws out of any animal, and usually eat the entirety of their prey. One time a family of Devils were found to have eaten a horse and left only the skull and tail. When feeding on roadkill, Devils generally eat everything including bones, fur and feet. Devils live for about seven years in their natural habitat of dry bush and scrub land. They were originally considered pests by farmers but are now appreciated for their ability in keeping down the numbers of crop-eaters such as mice. They are rarely seen because of their nocturnal nature, but tame Devils (can be touched) called Fie and Fum live at the Talune Wildlife Park. For those with hardy stomachs, Devil feeding takes place at the Tasmanian Devil Park at Taranna (near Port Arthur), 11 am daily, and also at the Trowunna Wildlife Park near Mole Creek. Tasmanian Devils feeding, 4.9Mb QuickTime movie. WARNING: Tasmanian Devils eat dead animals. If you do not like to see dead animals being eaten, do NOT download this movie.